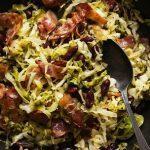 Simmer up this southern fried cabbage recipe with bacon for tonight’s family meal or wow your guests at your next gathering. Fried cabbage and bacon is the best thing since… well… bacon! The pair delights the taste buds in a way I never thought was possible, with a sense of salty and savory mixed with hearty and healthy goodness. One pot is all you need to cook up this quick and easy meal. Begin with the bacon and the rest of the flavors unfold in the pot. Other fried cabbage recipes don’t stand a chance with this southern classic! Cabbage is filled with fiber and loaded with Vitamin K and Vitamin C! It’s an excellent source of magnesium and calcium, and tossed up with bacon you’ll forget that you’re serving a healthy and delicious hearty meal! Cook bacon pieces in a large stock pot over medium heat for 10 minutes. Add onion and garlic, stir frequently and cook until the onion turns translucent, about 10 more minutes. Stir in the cabbage and continue to cook for 10 minutes. Season with salt and pepper, onion powder, garlic powder, and paprika. Reduce heat to low, cover, and cook for 30 minutes. Stir frequently so nothing sticks to the bottom of the pan.